Simple to Make Fly Holder for Fly-tying batch tasks. OK this is not about to be earth shattering, but I was looking for a fly holder that would hold flies securely, so I could “batch” process tasks i.e. adding UV cure resin, or head cement. So I grabbed an old fly-line spool, joined the two halves together, put a blob of 5 minute epoxy regularly spaced around the outside edge, and added line-testers. Just one thing, make sure the clip of the line tester is parallel to the edge of the spool. Now I can hold the spool in one hand and do what I have to do to finish off the flies. It is also good for taking outside on a sunny day to get a really good UV resin cure. Not sure anyone would want to actually fish them, but would sure like to own some. This is one of my favourite forms of fly fishing, especially on streams or small rivers. When ‘traditional’ dry fly or nymphing is just not getting the job done, swinging a wet fly often gets results. In fact, unless there is a rise on, I usually start out wet fly fishing. To me sitting on a bank waiting for a rise to kick in is a waste of very precious fishing time. 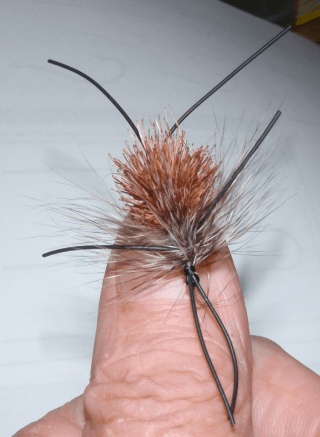 New Zealand High Country, High Tussock, Huge Hideous Fly – Perfect! Back a couple of months as the New Zealand summer meandered into autumn, I got an invitation that many anglers dream about. "Do you want to join us on a helicopter fly-in to the high country above Taupo, (central North Island of New Zealand)?" asked Pam, bless her! Despite my morbid fear of helicopters after some very dodgy experiences in my time in the army, I hesitated for about half-a-heartbeat, and blurted out "Yes! Please." The day arrived and of course there was low cloud with drizzly rain, and every chance the flight would be cancelled. But no, the weather over the range was supposed to be fine and clear. round bubble under the rotors, and up, up and away we went over the range-top into the fine, clear sky as promised. The fly-in revealed the crystal-clear headwaters of the river we were to fish. It was fairly Summer low, with shallow runs dropping into pools where the river turned in an apparently never ending series of bends. All framed by high country tussock, right up to the mostly steep banks, dropping near to, or vertically into the water. Beautiful! A worm – a fly by any other name? There are a number of worm imitations available for fly fishing – and they can produce fish. But for many more-traditional fly fishers, using this kind of fly, or lure, or artificial bait, your name call, will most certainly not get you into fly fishing heaven. 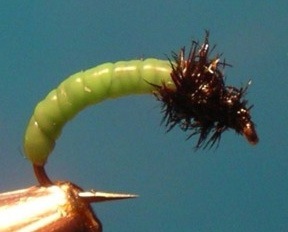 This worm ‘fly’ sold by the venerable Orvis company is called the Skaky Worm. So I guess the problem, if there is one, is just what constitutes the difference between a fly and lure. I am happy to produce from the 1000+ fishing quotes page this gem that will clear the matter up once and for all. Or not. “The artificial, the ‘winged lure’, the ‘feathered Judas’: a fly is a fly is a fly…except when it is a lure. The terminology is difficult, because fly, as well as referring to the artificial copy of a natural insect, also refers to an artificial copy of a small fish (a ‘lure’). Therefore all flies are lures, some flies as ‘lures’, and all lures are not ‘flies’. Everybody clear now? Good. Let’s move on. Finding an accurate hook size chart has been difficult, many are wildly inaccurate, even from reputable manufacturers – but at last I found one. I have just uploaded a PDF document of Tiemco fly and salt water hooks. The sizes appear to be fairly accurate, but only if you print the chart at 100%. Sizes on your screen are not accurate as they are distorted by the pixel setting your screen uses. The hook styles and shapes do not cover all hooks, but all the basics are there, so it is an excellent overall guide. For full run-down of hook information see this. What makes a fly pattern “new”? Midcurrent has a short article on the decision making process that goes into deciding whether a “new” fly is really new enough to be included into the Orvis range of flies. I was first introduced to foam flies around ten years ago. One of my favourite dry flies up to that point was the big ugly ‘Madam X’, which is basically a big clump of deer or elk hair, over a yellow body, with rubber legs in the shape of an X, hence the name. Madam X was very successful for me, but it had a major drawback, the same one that affects all fur, hair and feather dry-flies, you have to dry the damn things every five seconds. So when I saw foam flies I was hooked, and as it transpires so were plenty of fish. I would back a big fugly foam fly splashed down over fish feeding on miniscule somethings, to an imitative pattern any day. No, not the flies that gather round your rubbish bags in Summer, but flies to catch fish using items found in trash. Fly Fish Magazine has an interesting article on tying flies using materials rescued from all sorts of discarded stuff that would usually end up in the rubbish tip. 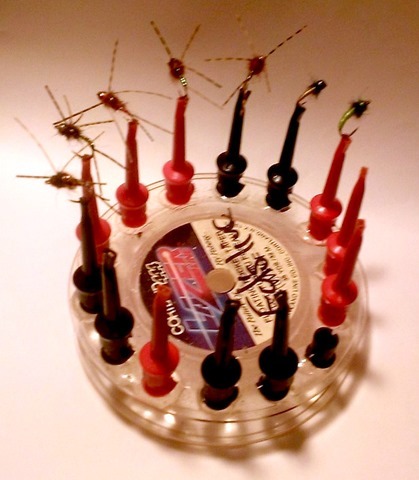 Carolina fly tyer, Brad Sprinkle shows that a bit of creative recycling can be a real asset at the fly tying bench. The fact that it can save a bit of money on materials is a definite bonus as well.